So...recently, I redid my design site. (Holy did it need an update Batman!) I used the only. good. picture. of me ever (me in the cowgirl costume) and did a b/w treatment on it. I thought it was fun and sassy, and since it was a site for a designer...that seemed suitable. Well...I've gotten some nudges and ribs from some of my bloggy pals saying..."You gotta do something about that profile pic Warden." 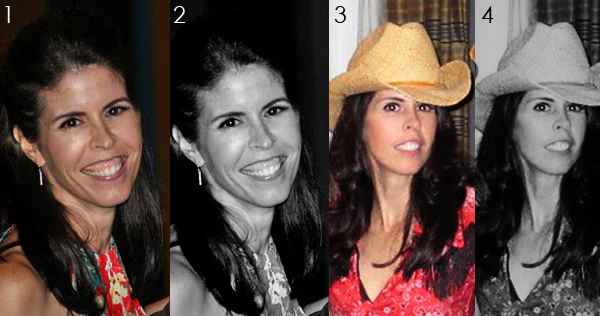 I put it to you my brilliant readers...Which profile pic should I be using??? I love the cowboy hat look - but then, I'm a sucker for anything that reminds me of chaps. #1....I still need to dig farther...I'm sure that I have something good. It's fun to see how the color and black and white versions actually look different. Your new look is great. I love the creamy background. Being MALE, I like #3 & #4 - Black is my favorite color for certain items of clothing. #3 I think is the best. #1, yo. It's 100% you. I love the hat, but #2 is my fave! I love your makeover on NWdesigns by the way!! I say the hat B/W for design! Other than that - go with what you like!! I'm late on the this one, but I love #1. It's totally you. Gorgy.